The Asian tiger mosquito – first found in the United States in southern Texas in 1984 – is now the most important pest mosquito throughout the Southeast. The spread of this mosquito, with a silvery-white stripe bisecting its thorax, has important public heath consequences due to its transmission of dangerous human pathogens, particularly dengue virus. Entomology Professor L. Philip Lounibos is focused on understanding the processes that have allowed the Asian tiger mosquito to become so widespread in the United States. 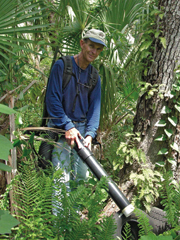 “Our studies are focused in Florida where we found that some of the resident species have resisted the effects of this invasive species and others haven’t,” Lounibos says. inferior to the Asian tiger mosquito, Lounibos and his team found that it escapes predation better than the Asian tiger mosquito. “As a consequence, the native mosquito doesn’t suffer as much from competition from the Asian tiger as it normally would in the absence of predators,” he says. Lounibos and his team, who work from IFAS’s Vero Beach Florida Medical Entomology Laboratory, have gained insight into the impact of biotic factors (larval competition effects and larval predation), and interactions with abiotic factors (desiccation), that have added to understanding of why the Asian tiger mosquito has spread. In addition to studying in Vero Beach, Lounibos also has a research component in Brazil, where thousands of cases of dengue occur every year.